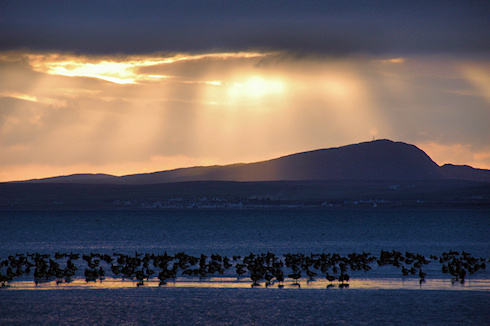 This was taken at the top of Loch Indaal in October 2009. Geese roosting in the foreground. Beinn Tart a'Mhill above Port Charlotte in the background. The sun breaking through dark clouds above. As usual I will post a larger version of this picture on the Islay Pictures photoblog on Saturday morning. Until then, have a great weekend! PS: Just in case you hadn't noticed, this is the Friday Islay picture nr 150. In words: Onehundredandfifty. A good enough reason to pour myself a Bruichladdich PC8. Feel free to join in the ‘celebration’ with a good dram of Islay single malt.